Karthik Calling Karthik works as a witty one-liner romantic comedy within its psychological thriller body in the first half. It just lets the cat a little too soon out of the bag as things turn eerie in the post-intermission part. The mental disorder that is the base of the movie, is both the film's strength and its give-away. Even if you manage to figure out the puzzle yourself before the film's characters, there is enough strength in the film's story, visuals, performances and music to make up for an entertaining (if not nail-biting) evening. 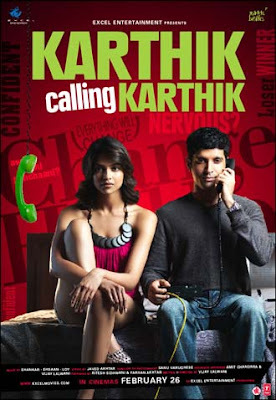 I probably expected a classic, but Karthik Calling Karthik does hold its ground as a decent thriller. Worth the ticket. Vijay Lalwani is certainly a director to watch out for and Farhan Akhtar plays his most difficult role (yet) of his acting career competently. Deepika is adequate. Composers Shankar-Ehsan-Loy have a couple of winners- Hey ya and Uff teri ada that gel with the scenes, so does Kaise yeh udasi - Kailash Kher's vocals elevate the song.